It would appear I'm in the mood to combine 2 things and make 1 thing out of them. A few days ago, it was a dessert...and now dinner. This is one of those dishes I've been making since the beginning of time. My cooking time, that is. I don't even remember the first time I made it, or how it came about. Did I see a recipe or picture somewhere? Did I eat something similar? Did I just throw some things together and come up with it? Really. Drawing a blank here. You may even make something like it...it's not fancy or complicated...just an everyday dish...comforting and satisfying. 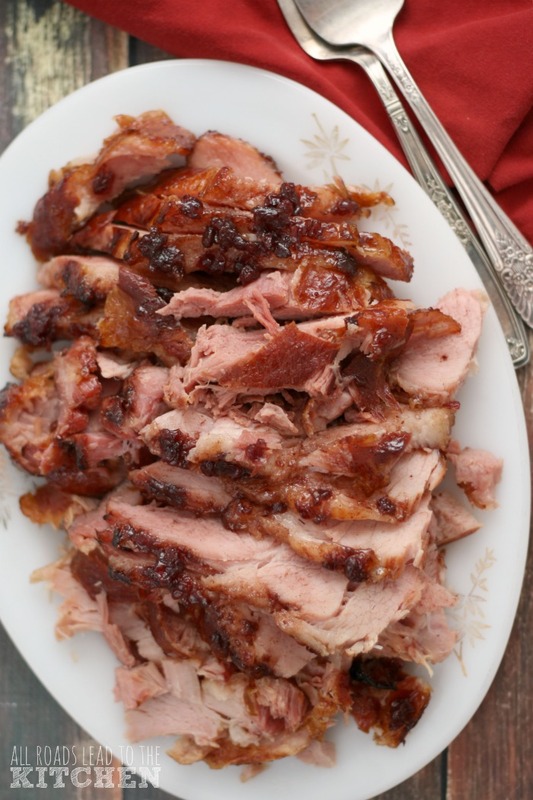 This is one of those great dishes that can be customized to your tastes so easily! Meat lover? Veggie lover? A little bit of both? Then this is the dish for you! Unless you don't eat carbs. And then I just give you a weird look shrug and an eyebrow raise. It's also good reheated for the next couple of days...or eaten cold, like my son does in his lunch box at school. 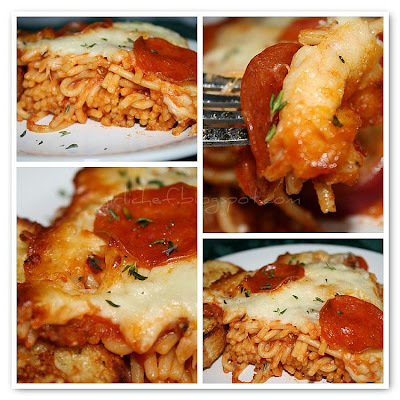 Pizza Baked Spaghetti by girlichef This works best in a 12" cast iron skillet. Well, I imagine that's the way it works best because that is how I've made each and every single time...my beloved cast iron skillet that has been with me since the beginning. And remember, add any other veggies you like at the point where I add the onions & garlic. Add any other meats & veggies as the pizza topping in the end, also! ~1lb. spaghetti, cooked to al dente ~3/4 lb. 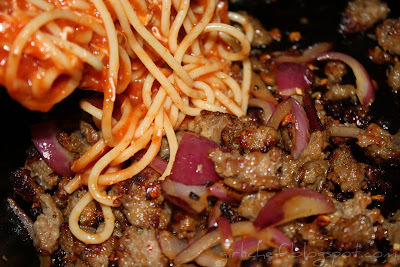 Italian sausage, loose (out of casings) 1 red onion, sliced 3 cloves garlic, minced ~4- 4 1/2 c. Spaghetti sauce of your choice Italian seasoning- to taste ~1/2 c. + 1/2 c., (divided) Italian blend cheese or simply freshly grated Parmesan 2 c. Mozzarella, shredded Pepperoni Preheat oven to 375 degrees F. While the oven is preheating, brown your Italian Sausage in your large skillet. 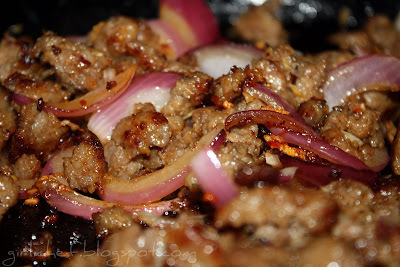 Once it is almost cooked through, add your onions & garlic and continue to cook until sausage has finished cooking and onions and garlic are soft & slightly caramelized. While this is cooking, prepare your spaghetti noodles. Add the sauce (cold is fine), the 1/2 c. of Italian Cheese Blend or Parmesan and your Italian Seasoning and toss well to combine. Add your pasta mixture to your skillet with the cooked sausage and veggies (off the heat). Stir everything up well to combine. Pack and flatten the whole mixture into the skillet. Top, in a pizza-like fashion, with the remaining Italian Blend/Parm. cheese and the Mozzarella. Arrange pepperoni over the top. Transfer to preheated oven and cook ~15-20 minutes or until cheese is hot & bubbly and sauce is heated through. Let cool for at least 10 minutes or so, giving the cheese time to "set" a bit. Cut into slices, like a pizza and serve! 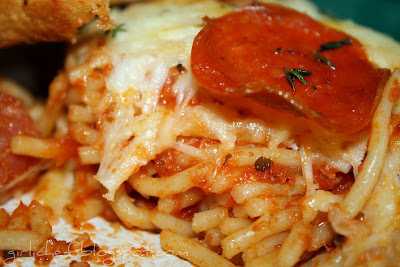 Or just scoop it out, either way...I just go with the whole Pizza Baked Spaghetti theme! Comfort food! Be careful, it's addicting. This is my Presto Pasta Nights #129 entry. 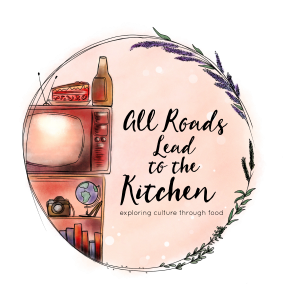 I'll be sending this over to Ruth of Once Upon a Feast who is not only the host this week, but the creator of Presto Pasta Nights! click on the picture to check out more pasta at PPN! now THAT is something I could devour in 10 seconds flat! And I'm with you - carbs are the BEST!! This is delicious looking. We might have to have this the upcoming week. This is the same idea as the pizza casserole I make, only of a much finer quality! I'll be bookmarking this one because it looks sooooo gooood! I bet my kids would love this too!I'm definitely going to put it on the menu! PS - Carbs rule! I can give up sweets, do strenuous weight workouts and even give up my beloved beer but don't ever ask me to give up my carbs! Its all about the carbs! This looks delicious! Thanks for sharing! Carbs are my best friends. This would be a great way to use up leftover pasta. My son would absolutely love this! Nice. Two dishes in one? Who would say no to that? Besides everyone loves pizza and spaghetti. A an awesome 2 for 1 deal. 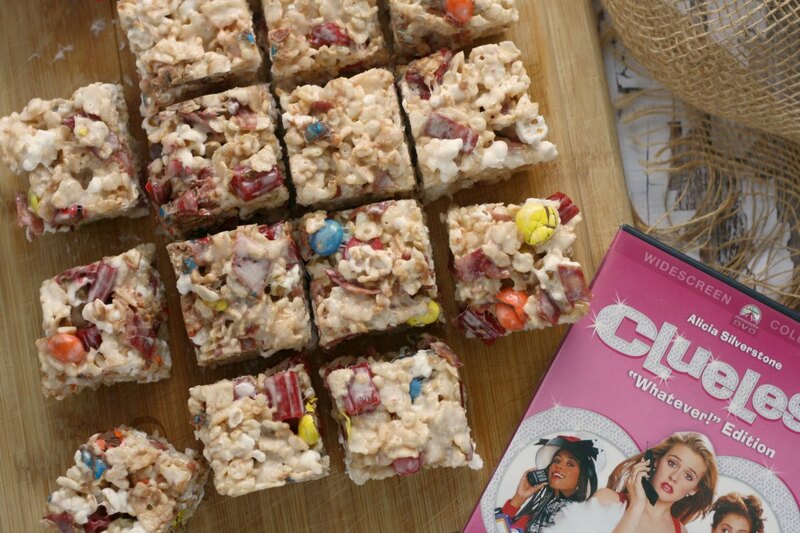 I'm definitely making this soon. 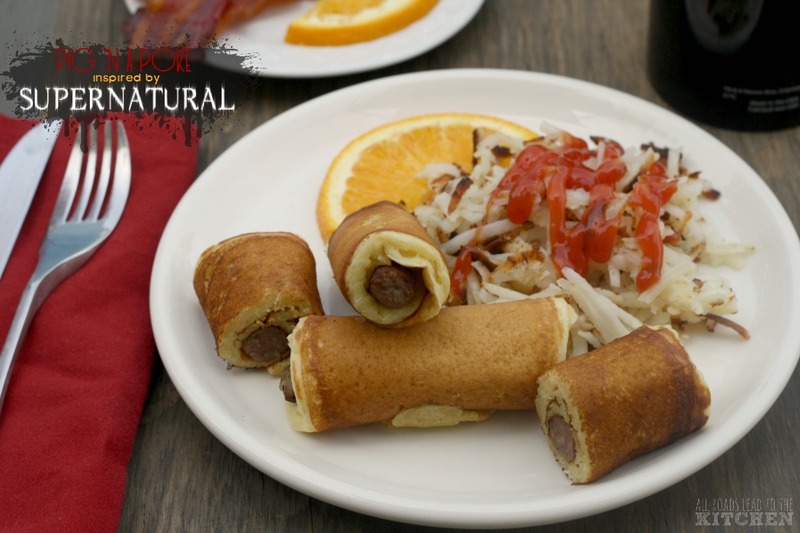 A perfect way to combine two of our favorite foods!!!! Can't wait to try this! vat a great idea girlie!! ive never tried pizza this way! yumm!! my kids vud definitely love it! That is quite the combo, I'd say you're on a roll with these duos! omg.... seriously? WOW!! Thats like ultimate spaghetti!!! I bet my family would LOVE that! MUST TRY!! SOON! Like....this week!! YUM! I think that would be a hit in my house! Oh, yeah, BIG carbs fan right here, grins. My cast iron skillet is screaming for this! Gawd, I need to slow down when I read...I saw the word pizza and the wonderful pic...started scrolling....saw spaghetti....WTH? Had to go back and 'digest' what I was seeing again....LOL. I need to make spaghetti more often just for the leftovers of making THAT! Yum girlie! I'll take some of that too...yum! That's a brilliant combination. I totally want to make this dish...it's also on the Sept. menu. Thanks for sharing! This is the best of two worlds!!! It looks kind of like my spaghetti pie - only better! I've something similar to this and it was sooooo good! A great family pleasing meal- Yum! Yours looks perfect! How cool is that recipe!!! Wow! 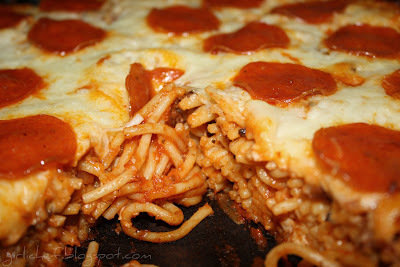 I've had a spaghetti pie type thing, but I've never topped it like a pizza. Genius! 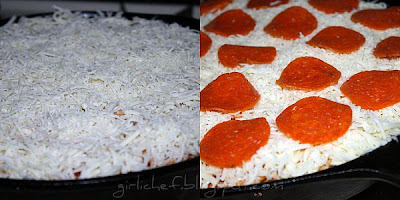 Looks so good, I have done this before, without the pepperoni, and with eggs, and we called it spaghetti pie, I like the pepperoni much better, Great idea! That is one genius recipe!! 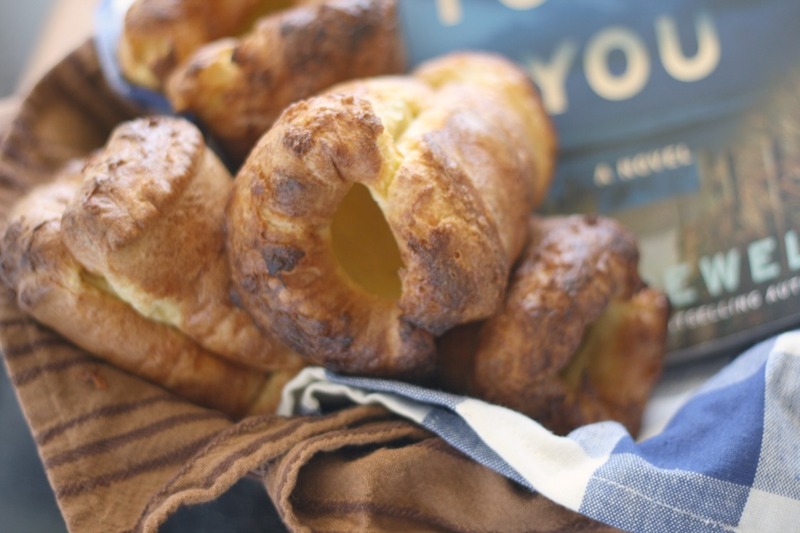 A very creative and comforting meal that adults and kids LOVE!! I'm going to try that at home with my much-loved cast-iron pan (a cook's best friend). It's the best of both worlds - I love it! Very creative! Well, I gotta tell ya, this is just about the coolest meal around! My daughter would die over this one! She loves spaghetti and pepperoni pizza! Brilliant! This is absolutely genious! I;d make everything into pepperoni pizza if I could! This sounds heavenly!! I have ten grandchildren that would inhale this. Now here is something to sink our teeth into Heather. These kinds of dishes are so comforting and homey...simply the best kind. Hahah this is awesome! How creative - I bet kids love this stuff! Yes those non-carb lovers are just weird. They are very very weird. I think I need to eat this for lunch, cold, everyday for a while. It looks fantastic! Kind of like a pasta frittata. Super! I used to laugh whenever son came home from school and answered "pizza with pasta" when I asked him what they served for lunch! But this all-in-one looks fantastic and if I showed the pic to son he'd drop to his knees and beg! When I read the title and looked at the first picture, I was like, where's the spaghetti??? Then I saw as I scrolled down. That's so neat! This looks like a good potluck meal. Not too deep, so you aren't overfilling your plate, but enough delicious stuff for a really scrumptious bite. This will be on my table as soon as the weather cools. It really looks delicious. Oh this is definitely comfort food!! Would have never dreamt of using spaghetti as a base-amazing!! Cool, I love it! 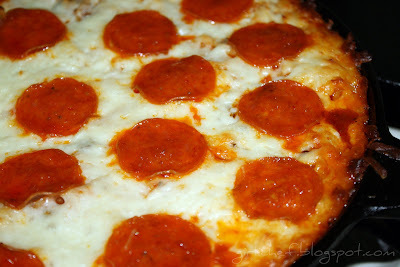 Great idea to use spaghetti as a base for a delicious pizza! 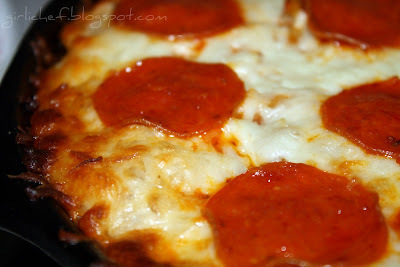 How decadent and delicious looking--love that pepperoni on top! Oh my word, this looks amazing. I can't wait to try this soon! Have you ever tried it with leftover spaghetti, or would that be too gloppy? 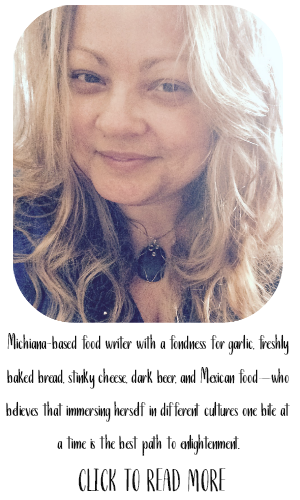 ms. kitchen angel....honestly, I have never tried it with leftover spaghetti. I always make it as the initial dish as opposed to leftovers. I may have to give it a try next time, just to see...because a lot of people are talking about using it to use up leftovers.... let me know if you decide to try it! 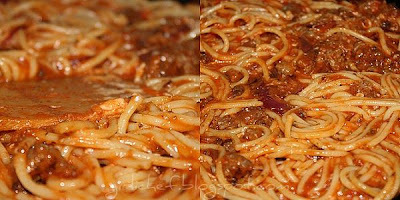 This looks sooo much better than plain ole spaghetti! I am definitely making this. that looks amazing!! !thanks for sharing. You can grab a big pizza offer Buy One Get One Pizza Free at Bellacino's Pizza and Grinder. WOW! My 16 yr old son would flip over this! I'll be making it soon. 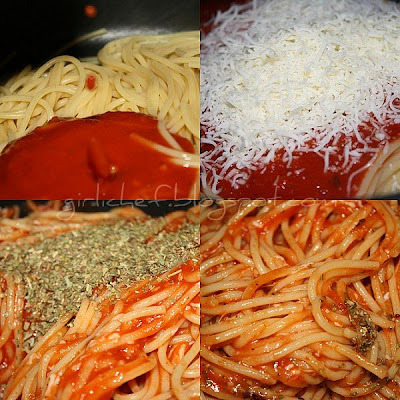 I love how you included the sausage in with the spaghetti and used the pepperoni on top! this just might be the coolest pizza i have ever seen! This is a great idea! Looks AMAZING!